A vigorous variety, mid green leaves with blue-grey undersides. The flowers are reddish-purple outside fading to yellow during May-June and again in late summer. These woody twining climbers are excellent for rambling over large trellis or trees. Their roots benefit from being shaded. Prune evergreens in the spring and later flowering varieties in autumn as required. 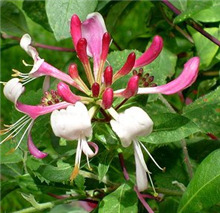 See photos of Lonicera periclymenum in real gardens.